To raise, pull upwards. To lower, press on the unlocking button and on the head restraint. The adjustment is correct when the upper edge of the restraint is level with the top of your head. The head restraint is also angle-adjustable. To remove, press on the unlocking button and pull upwards. Note: Never drive the vehicle without the head restraints fitted. Lift the control bar and adjust the seat to the desired position. Turn the control to adjust the seat to the desired position. Raise or lower the control the number of times required to obtain the desired position. Use the control A to adjust the backrest angle. It is possible to recline the backrest to an angle of 45° by tilting it until it locks; press the control to unlock. To access or exit the rear seat positions, tilt the control 6 towards the front to fold the front seat back-rest and slide the front seat forwards. Afterwards the front seat will revert to its initial position. Make sure that the seat is securely locked in place. Raise or lower the front of control 1 to make the front of the seat cushion higher or lower. 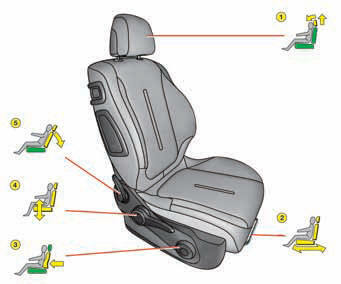 Raise or lower the rear of control 1 to make the seat higher or lower. Action control 1 to the front or to the rear to move the seat forward or back. Push the top of control 2 forward or back to adjust the backrest angle. Raise or lower control 2 to increase or decrease the lumbar support. - when opening one of the front doors. - after switching off the ignition. The seat temperature will adjust accordingly. Note: The heated seats will only operate when the engine is running. You have the possibility to memorise two driving positions, via the buttons M/1 and M/2. - press on button M then immediately on button 1 "first driving position" or on button 2 "second driving position". - Press briefly on button 1 or 2 to recall the corresponding memorised position. Note: after five consecutive recalls of a memorised position, this function will be deactivated until the engine is started. - Keep button 1 or 2 pressed to recall the corresponding memorised position.